DSC_0003.JPG, originally uploaded by michael_jecks. There are few people in this world who can be admired as professional in the truest sense – but here are two. I have always been in awe of Waterstone’s and Ottakar’s staff. The two firms have been marvellous and extremely kind to me over many years. 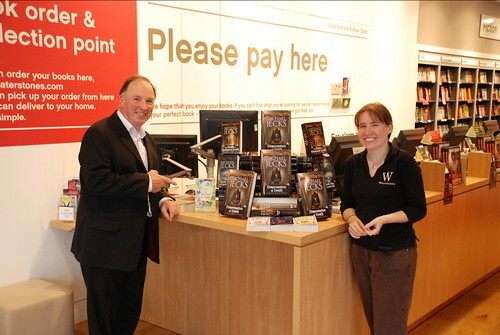 No one has done more for me than Claire and Graham in Waterstone’s Exeter. Both are enthusiastic, as are Nigel and Roham in the other Exeter branch. But I have to mention George Gamble. Unassuming, generous, kindly to a fault, he is that rarest of creatures, a professional salesman who is always honest, fair, and full of integrity. I have yet to meet a Headline client who does not hold the very deepest respect for this bastion of salesmanship. Personally, I owe him much for his determination and effort over the last thirteen years. All best wishes, George! This entry was posted on Thursday, June 14th, 2007 at 12:05 am	and is filed under Dartmoor. You can follow any responses to this entry through the RSS 2.0 feed. You can skip to the end and leave a response. Pinging is currently not allowed.